Gershwin Songwriting Prize: Paul Without John? Paul McCartney is the third recipient of the Gershwin Prize for Popular Song, awarded by the Library of Congress. But the announcement comes with no mention of the partner with whom McCartney wrote his best songs: John Lennon. What were they thinking? Gershwin Songwriting Prize: Paul Without John? John Lennon (at left) and Paul McCartney in November 1963, just before the release of With the Beatles. Wednesday, in a White House ceremony, Paul McCartney received the Gershwin Prize for Popular Song. In the words of the press release, "The Gershwin Prize for Popular Song was created by the Library of Congress to honor artists whose creative output transcends distinctions between musical styles and idioms, bringing diverse listeners together and fostering mutual understanding and appreciation." To which does that phrase best apply: The Beatles? Or Wings? Librarian of Congress James H. Billington chose McCartney (with input from a panel that included Paul Williams, Carole Bayer Sager, Jimmy Webb, Paul Simon and -- I'm not kidding -- Rickey Minor, the music director of American Idol). In making the announcement, Billington said, in part, "Sir Paul has been writing and performing for more than five decades. ... But he also has made an impact far beyond music through his humanitarianism and activism around the world, which are emblematic of the spirit of the Gershwin Prize." Wait a minute. Wasn't John Lennon the "Give peace a chance" guy? The one who put his career and fame on the line to actively protest the war in Vietnam? And Paul McCartney wrote "Ebony and Ivory"? Back to the press release: "The prize commemorates George and Ira Gershwin, the legendary American songwriting team ... The prize is awarded to musicians whose lifetime contributions in the field of popular song exemplify the standard of excellence associated with the Gershwins." "Songwriting team." "George and Ira." John and Paul. The Library clearly understands that songwriting can be a collaborative effort. And if ever there was a late-20th-century analogue for George and Ira Gershwin, it would seem to be John Lennon and Paul McCartney. So what happened to John Lennon in all of this? McCartney, Lennon, George Harrison and Ringo Starr created music together. But the songwriting credits were most often listed as Lennon/McCartney. 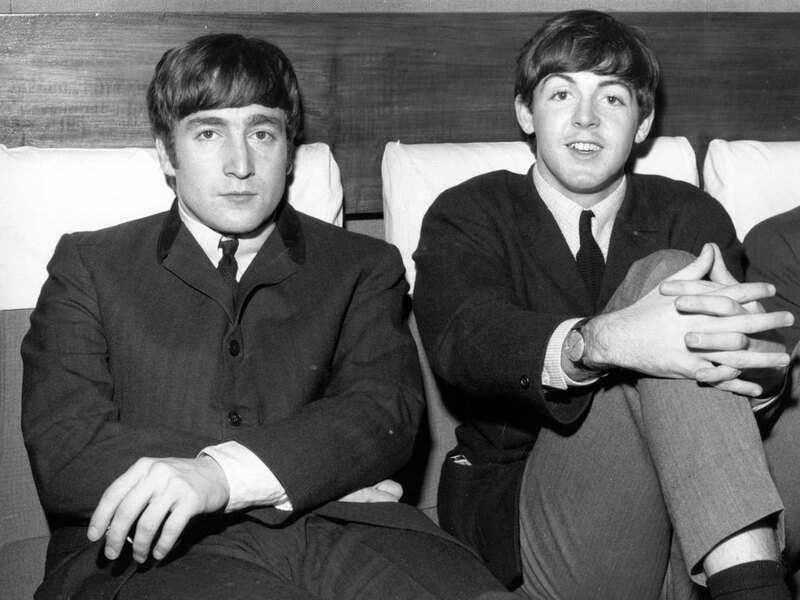 Both of them agreed -- in interviews -- that some songs belonged more to one than the other: "Yesterday" is McCartney's; "In My Life" belongs to Lennon. In 2002, McCartney created a stir when he released his Back in the U.S. album with songs that had been credited to "Lennon/McCartney" revised to read, "written by Paul McCartney and John Lennon." It's understandable that McCartney would like the credit that's due him, but this seems petty, and I truly hope that Lennon's omission from the Gershwin Prize has nothing to do with this lingering bitterness. But the Library's website does not even mention John Lennon's name, citing McCartney as "the writer and co-author of The Beatles' greatest songs." That's it? No mention of the other "co-author" by one of the most vaunted research archives in the world? I have to be blunt here and ask, Did Paul McCartney write anything after he split with his partner that holds even a dim candle to what they wrote together? I welcome your suggestions -- but think really hard. Maybe John Lennon remains a little too controversial. His remark, discussing Christianity in a London newspaper, "We're (The Beatles) more popular than Jesus now," still gets quoted. Lennon was direct -- maybe too in-your-face for his time. McCartney was always the nice one. Or maybe the Library feels that the winner of the Gershwin Prize should be a living musician -- its website does not list that as one of the criteria -- one who can perform at a star-studded White House concert to be recorded for broadcast, and re-broadcast, on PBS. The previous two winners have been Paul Simon and Stevie Wonder, both deserving choices. So why not Bob Dylan for Gershwin winner No. 3? George and Ira rolled into one. But Paul McCartney alone? No. Shouldn't the Library be more of a "library" and guide us to someone we should know more about? Remember Jimmie Rodgers? He incorporated country, blues and popular song -- all of the great American songwriting traditions -- and transcended them all. He left a legacy of classic songs that's very much alive nearly 80 years after his death. And besides, is there an award Paul McCartney has not won? But McCartney is still cute and cuddly and makes good press -- witness the fawning coverage of Tuesday's press conference at the Library. And therein may lie the answer to the questions. The choice for this year's Gershwin Prize seems to fall in line with the Library's choices for the National Film Registry (from The Birth of a Nation to the Muppets' movie debut) and the National Recording Registry (from Thomas Edison's 1888-89 Around the World on the Phonograph to Bruce Springsteen's Born to Run); honors that mix archival material deserving of the Library's formidable resources for preservation and scholarship with a kind of feel-good recognition of popular films and songs that will make nice headlines -- headlines that just might draw wider attention to the Library's deserving efforts. The Library of Congress is home to such inspired popular music as the Jelly Roll Morton collection, as well as the bedrock of American culture that is the Archive of Folk Song. It holds more than 6,000 books that belonged to Thomas Jefferson. Just to sit in one of its reading rooms is awe-inspiring. It's kind of sad to think that it feels it needs the kind of recognition that Paul McCartney will bring. If you're about real achievement, which the Library is, then it's incumbent on you to recognize the real achievers. Their names are Paul McCartney and John Lennon.